We very much doubt that the Benitz families of the Black Forest (Baden) and Prussia are related. They are separated by a considerable distance. Also, before the 20th century common people simply did not move around that much for to do so required the permission of the powers that be. It is much more likely a coincidence of spelling. We have not researched the Prussian Benitz families. However, Jochen Bonitz, in his comprehensive Bonitz Forum website, considers Benitz to be derived from Bönitz. He provides extensive lists of references to Bönitz / Benitz who lived in Europe and the Americas. We know of one person (Heinrich Benitz) who emigrated to the US (in the 1870's) from the Pomeranian village of Zemmin, at that time in the Kingdom of Prussia. Today it lies within the Länder (state) of Mecklenburg-Vorpommern. It may be a coincidence but a village just to the north of Zemmin is named Bentzin — “Bentz” with the German female “in” suffix. Is there a connection? 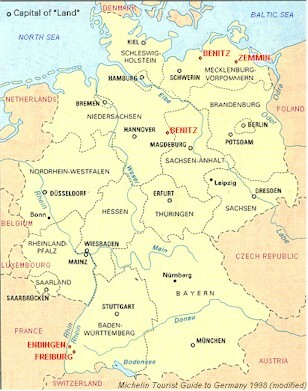 There are also two villages named Benitz in the same general area. 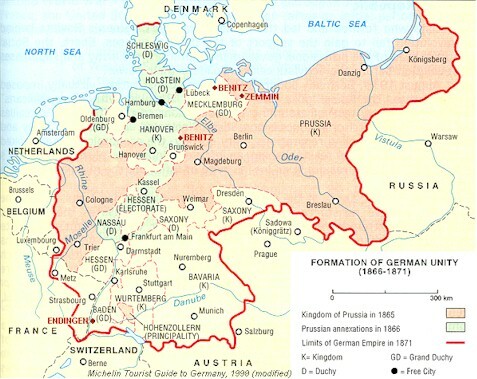 The two villages named Benitz are both located in the Great Northern Plain of Germany in what was Pomerania, absorbed by the Kingdom of Prussia during the 19th century. The most northern of the two lies inland about 20 kilometers directly south of the Baltic port of Rostock. The other is located in north-central Germany about 75 kilometers north-east of Hanover. Heinrich Benitz (1824-1900) emigrated to the US during the early 1870's from the Pomeranian village of Zemmin, at that time in the Kingdom of Prussia. 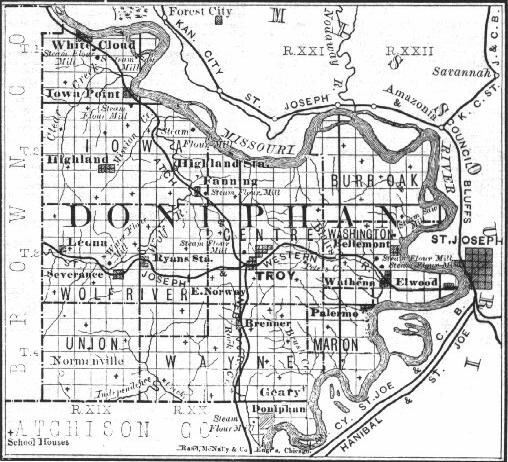 He settled in Wathena, in eastern Kansas (see map below). His many descendants have prospered and are leaders in their communities (doctors, lawyers, state government office holders, etc. ), mostly in Kansas and Washington states. 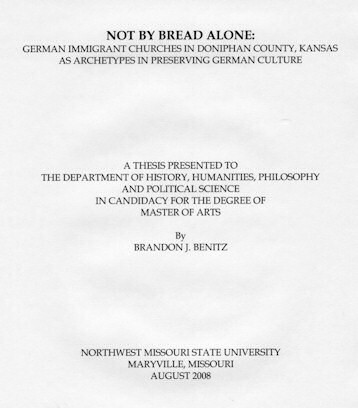 Brandon, a descendant of Heinrich’s, requested we make his thesis available on the web. Throughout the Midwest, the Germanic peoples who immigrated to the United States in the nineteenth century viewed the establishment and continuation of their local church as one of the most important entities in their lives. Germans reconstructed their own enclaves of their former society in America by using the local church as the centerpiece of their new society. Using two churches in Doniphan County, Kansas, founded by the author’s ancestors, as detailed case studies, this thesis chronicles the history of select German immigrant churches, church organizations, and pockets of German immigrants throughout the Midwest as archetype factors for the preservation of Germanic culture. Specifically, four functions are examined to provide evidence of the importance of the local church as the centerpiece of the immigrants’ new society—the establishment and continuation of the church itself, the establishment of a church-sponsored school, the longitudinal persistence of the German language in the church’s activities, and the establishment of a church cemetery. Using each of these four functions, German immigrants throughout the Midwest, particularly those in Doniphan County, were able to preserve their culture for decades after their immigration. For them, their church was the centerpiece of their society for a number of reasons but most importantly, it served as the best medium for preserving their German culture and gave them their very identity. and the Christ Lutheran Church’s Christian Day School. As seen in William G. Cutler's History of the State of Kansas. Image Courtesy of the Kansas State Historical Society.